SUNY Oswego recently learned it will receive the American Association of State Colleges and Universities (AASCU) 2017 Excellence and Innovation Award in International Education, a national honor that cites the college for its efforts to embed study abroad in the curriculum and to make study-travel opportunities more accessible to under-represented students. AASCU's president, Muriel Howard, commended SUNY Oswego in an award notification letter for its approach to providing a breadth of travel options tied to coursework, as outlined in the college's application for the honor: "Embedding Global Engagement and Action into the Curriculum: Using Interdisciplinary Faculty-Led Study Abroad to Address Global Challenges and Effect Global Change." The awards committee selected SUNY Oswego's program as "an exemplary one that can serve as a model for other institutions and help to advance practices in the field," wrote Howard, the chief executive of the association representing more than 400 public colleges, universities, and systems. "Being recognized as a national leader for innovative and expanding education abroad offerings epitomizes SUNY Oswego's efforts to ensure access to all that public higher education has to offer," said SUNY Oswego President Deborah F. Stanley. "We take pride in our campus commitment to international living and learning opportunities and our collective focus to make study abroad attainable for all our students." In its citation, AASCU also singled out the student-mentored I, Too, Am Study Abroad program, administered by the college's Office of International Education and Programs. This program seeks to raise awareness of the benefits and potential sources of financial support for international study and travel among a broader diversity of students. SUNY Oswego also received recognition for its BikeShare and BusShare programs, earning an Innovative Project Award in the Sustainability and Sustainable Development category. AASCU will bestow the awards at its annual meeting Oct. 22 in La Jolla, California. Dr. Joshua McKeown, associate provost for international education, expressed appreciation for the AASCU honor. While the college continues to offer many traditional study-abroad opportunities of up to a year in duration, it has worked with numerous faculty members to tie student travel experiences -- as short as a week in length -- to coursework that makes study abroad an integral part of a dynamic learning experience. "We have expanded our program offerings quite deliberately," McKeown said. "This award is recognizing a program model, the embedded program model, that I think SUNY Oswego has been particularly creative and I hope particularly effective in implementing ... Each year at least two dozen faculty members take part in programs like this." McKeown cited a wealth of such study-travel opportunities over the past several years: research on and engagement with victims of human trafficking in India, sustainable development and water quality in Ecuador, urbanization and air quality measurement in London and Paris, urban agriculture and sustainable farming in Cuba, and education reform in Benin, among others. Faculty and students in more than one major area of study often participate in each program. I, Too, Am Study Abroad uses a peer-to-peer series of approaches to market study-abroad's benefits, scholarships and other funding resources to students who might otherwise dismiss the possibility. 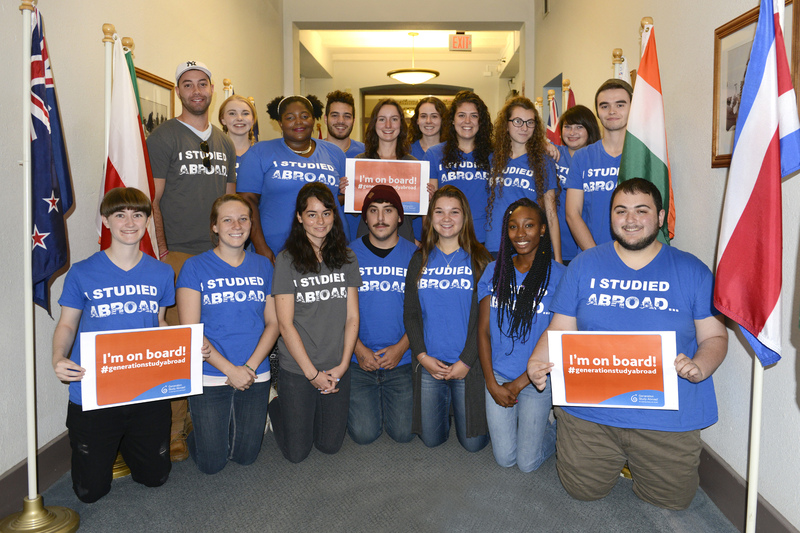 "You have to be very mindful that a lot of students come into the university experience not believing that study abroad or international education is something for them," McKeown said. "So we go to great lengths to dispel those myths, and we've been quite successful." Study abroad returnees offer a discussion series that includes such topics as "Race and Ethnicity Overseas," "LGBTQ Identities Overseas," "Beyond Issues of Race, Sexuality and Gender" and "Going Beyond the Classroom." While one-to-one student recruitment is crucial to the program, study abroad mentors also perform tasks aligned with their majors, such as public relations majors who blog about international education. The college and students have held a photo contest to highlight study abroad locations and posted extensively to other types of social media. International education at SUNY Oswego has garnered other recent national recognition, including a 2016 Andrew Heiskell Awards honorable mention from the Institute of International Education for I, Too, Am Study Abroad, and IIE's Generation Study Abroad recognition last fall that the college had achieved a goal of engaging 20 percent of students in international education opportunities. The college's Sustainability Office oversees the BikeShare and BusShare programs that make getting around campus and the Oswego community more efficient. BikeShare, founded in 2014 by then-senior Alex Elkins and increasingly in demand since, provides refurbished bicycles to students for a semester or a year at a time to encourage fitness and cost savings while helping cut down on car trips and parking congestion. The Sustainability Office also offers a web application, originated by former intern Alex Monachino, to find and report the times and other details of the most efficient bus routes to and from locations in the city of Oswego, encouraging the use of Centro and easing bus schedule anxiety. Winning the award is "really exciting," said Jamie Adams, coordinator of sustainability programming. "I'm really glad for the recognition these impactful programs are receiving." All abroad! -- SUNY Oswego recently won an American Association of State Colleges and Universities award for embedding short-term study abroad experiences in coursework across multiple majors. Here, student mentors working to raise awareness about study-travel opportunities celebrate an earlier national distinction, from the Institute of International Education.